Mainstream network-attached storage (NAS) solutions have evolved to such an extent that consumers can today pick from a wide range of affordable options knowing that the essentials - backup, media server, printer sharing and download client - will likely be taken care of with little fuss. The likes of Synology, WD and Qnap are among the first brands to come to my mind, and if you're looking for a NAS that touts a little extra in terms of innovation and feature set, it's Qnap who tends to stand out from the crowd. 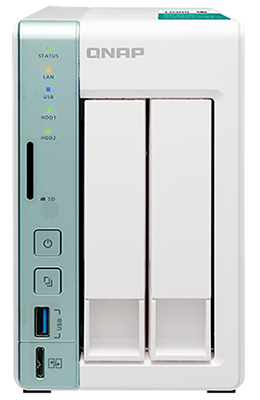 In addition to offering a vast portfolio of traditional NAS solutions, the Taiwanese manufacturer has developed a taste for innovative features, unique form factors and varied usage scenarios. Continuing that trend, the firm's new dual-bay TS-251A (from £280) and quad-bay TS-451A (from £380) offer a USB 3.0 QuickAccess port that, on the face of things, appears to make implicit sense. 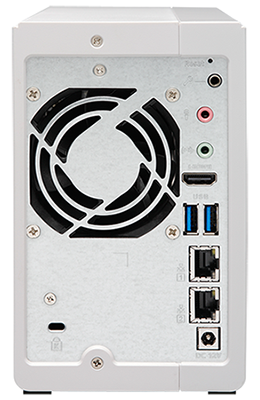 Positioned at the bottom of the front I/O ports, the QuickAccess port is used via a USB 3.0A to Micro B cable and essentially allows direct access to the storage device without the need for network connectivity. Sounds useful, however do be aware that the USB cable bizarrely isn't included in the bundle. We'll get on to the pros and cons of QuickAccess shortly, but first a quick tour of the rest of the box. As you might expect, the TS-251A is a typically feature-rich Qnap solution. 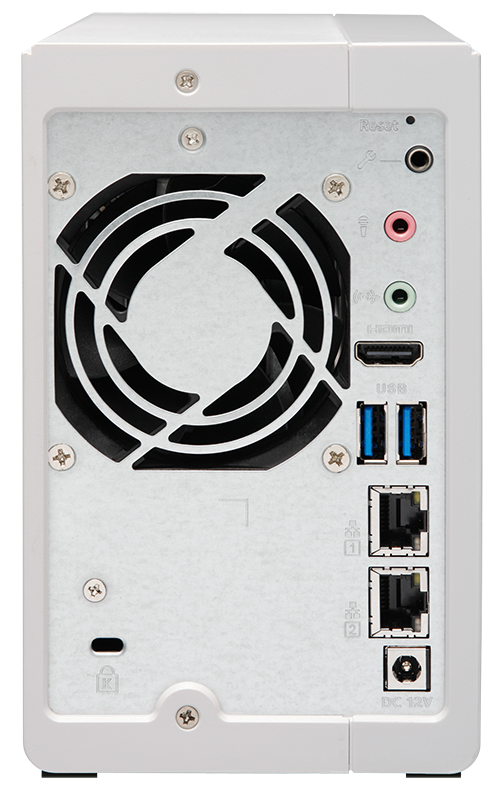 The front of the unit is home to a USB 3.0 port (with one-touch copy) as well as an SD card slot alongside the two plastic, pull-out drive trays. Neither is tool-free nor lockable, however screws are supplied and drives slot is easily. 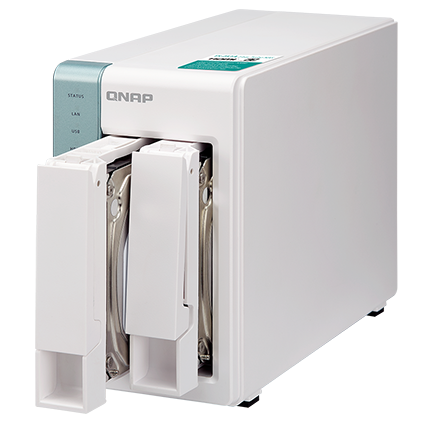 Build quality is basic but sufficient, and Qnap provides a nod toward the target mainstream audience by choosing a white chassis with blue(ish) trim as opposed to the customary black. It's a nice-enough unit in terms of appearance and the bulk of the connectivity options are tucked neatly around back, where you'll find dual Gigabit Ethernet, a pair of USB 3.0 ports, HDMI output and audio jacks, as well as a connector for the small, 65W power supply. Cooling is handled by a single 70mm fan and with the modern NAS taking a multimedia focus, there's an integrated IR receiver and a bundled remote control. Handy if you'll be hooking-up the unit to a big-screen TV for Kodi or Plex. Helping everything run smoothly is a dual-core Intel Celeron N3060 processor capable of burst speeds of up to 2.48GHz and either 2GB or 4GB of DDR3 memory, depending on model. Heightened hardware prowess is the first key differentiator between a NAS and an external drive, and it requires a comprehensive operating system in order to put it to good use. 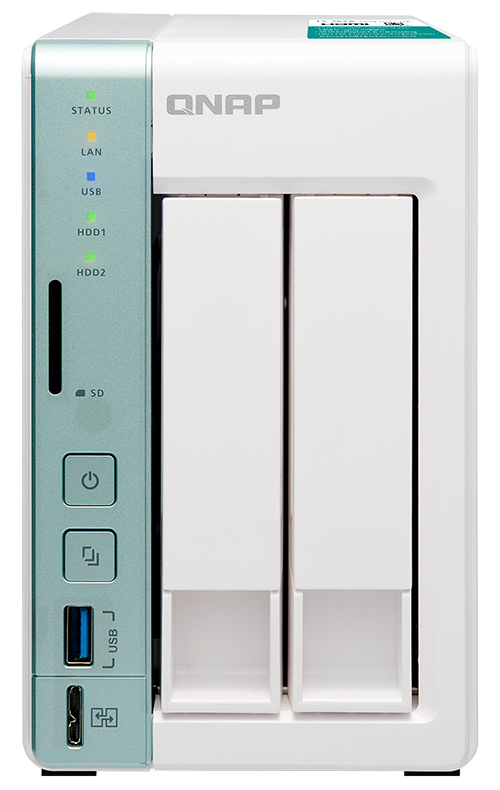 Qnap has one in the form of QTS, which we often refer to as one of the best NAS software solutions on the market today. 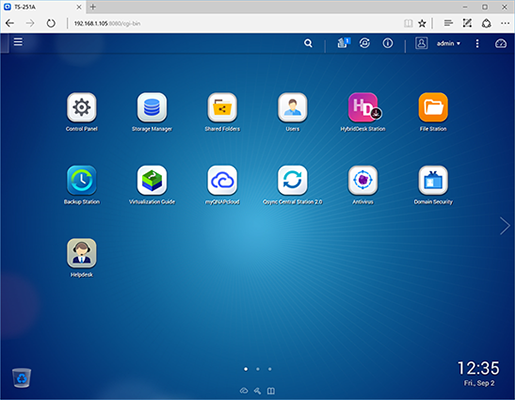 The QTS feature set is mighty impressive, yet the fact that it's equally accessible to NAS newcomers and networking experts is testament to the design and user interface. 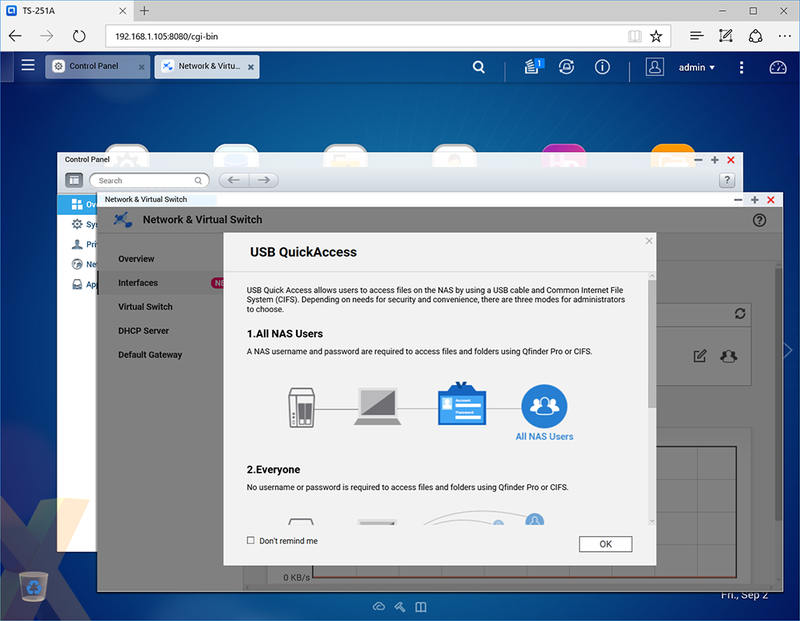 Everything from backups to virtualisation is catered for, and users familiar with Qnap products know to expect plenty more in between, but the feature that's of interest this time around is QuickAccess. A question that's likely to be pondered is why would anyone need to connect directly to the NAS via USB when the server is already available via the network? There's always the possibility of the network going down, but the more likely usage scenario, we feel, is laptop users wanting to transfer data or access files without the potential pitfalls of a WiFi connection. Many modern laptops don't feature Ethernet connectivity, so being able to attach via USB 3.0 could be a genuine value-add. How does Qnap make it happen? On the inside, both the TS-251A and TS-451A are equipped with a Realtek RTL8153 Integrated 10/100/1000M Ethernet Controller for USB Applications. Effectively allowing the front USB 3.0 to mimic a Gigabit Ethernet connection, meaning direct storage access and, should you need to, the ability to setup and configure the NAS via the admin panel. QuickAccess is a feature that may appeal to some users, however there are one or two caveats to be aware of. 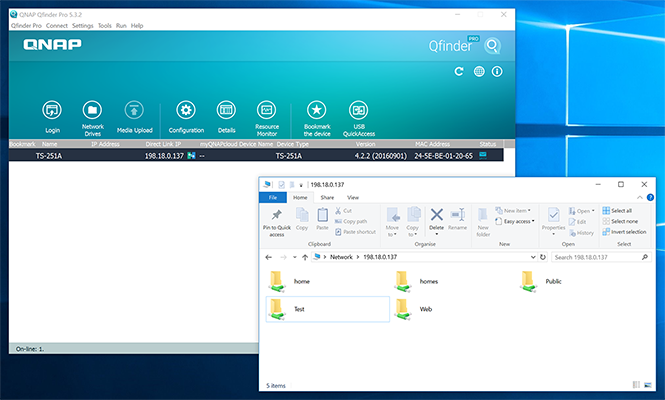 The first is that the TS-251A isn't a plug-and-play solution like most other external drives, and in order to access content you are required to install the Qfinder Pro utility available for Windows, Mac and Linux. 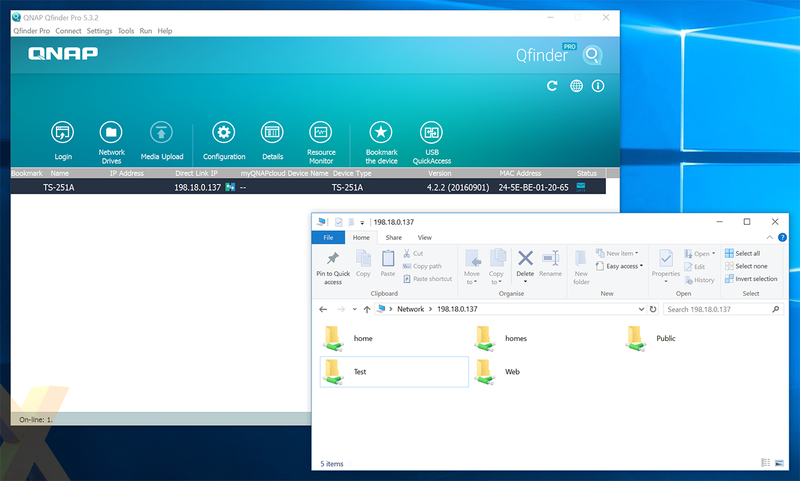 The software translates the network address, making it easy to open folders in the operating system's native explorer, and the QTS admin panel can be used to restrict folder access to certain users. The second caveat to be aware of is that the underlying connection is that of Gigabit Ethernet, so don't expect to be able to make full use of the bandwidth available from USB 3.0 or the intrinsic speed of the drives. In our own tests, the TS-251A managed sequential read and write speeds of 111.4MB/s and 116.7MB/s, respectively, via QuickAccess, closely mirroring the throughput results of Gigabit Ethernet. In a perfect world QuickAccess would require no additional software and be able to fully saturate the USB 3.0 connector, but for now, Qnap has added yet another useful feature to ever-growing arsenal.